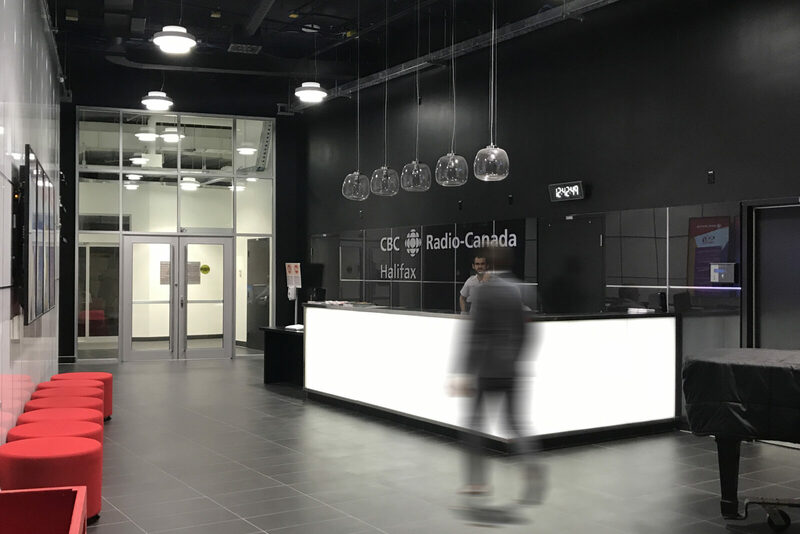 The Canadian Broadcasting Corporation (CBC) is Canada’s national broadcasting service, providing television, radio and internet services across the nation. CBC sought to consolidate its Halifax operation, formally located in two buildings, while reducing operational costs. The new facility is an adaptive re-use of a former Hudson’s Bay department store. Combining radio, television, performance and web media with management in one open space creates a democratic and energetic collaborative environment. The existing structure of the space has two grids, one angled and one orthogonal. The project respects the found conditions and maintains the high ceilings and exposed structure with focused work occurring in brightly coloured glass boxes scattered throughout the space. The art of making radio, performance and television is celebrated throughout the space, with open studios and glass technical spaces actively connecting visitors to the media experience.